ISBN-13: 978-0872209138 ISBN-10: 087220913X Edition: UK ed. 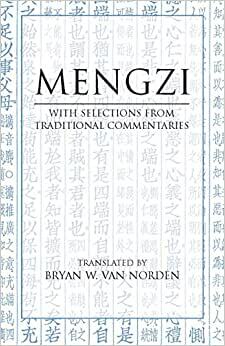 Bryan Van Norden's new translation of the Mengzi (Mencius) is accurate, philosophically nuanced, and fluent. Accompanied by selected passages from the classic commentary of Zhu Xi--one of the most influential and insightful interpreters of Confucianism--this edition provides readers with a parallel to the Chinese practice of reading a classic text alongside traditional commentaries. Also included are an Introduction that situates Mengzi and Zhu Xi in their intellectual and social contexts; a glossary of names, places and important terms; a selected bibliography; and an index. The Confessions: Works of Saint Augustine, a Translation for the 21st Century: 1st Ed. Start reading Mengzi on your Kindle in under a minute. Bryan W. Van Norden is Professor in the Philosophy Department and in the Department of Chinese and Japanese at Vassar College. 5.0 out of 5 starsGreat translation, minor reservations. There is no need to repeat all of the positives stated in the product review above. It is a very solid translation, probably the best available in contemporary English. I have four minor concerns. First, the translator adds his own commentary to the passages--and while this is mostly a good addition for the reader, sometimes he writes things like "It's a shame the Chinese Marxists didn't study this point" or the throwaway, " A very profound passage indeed!" I find such moments to be both insightful and distracting. They are insightful because it gives you a view into your translator--his prejudices, his need to always "be" in the text--and knowing things like this can help you weigh his presence as a translator, help you understand how he might be inclined to interpret if not slightly skew context, meaning, etc. They are distracting because, frankly, when reading Mengzi, you don't really want to read the translator, you don't really want to be told when a passage is profound for the translator or anyone else. And, say, if you're an expert on Chinese Marxism and the translator isn't, you might find his comments like the one noted above to be rather half-witted. The second concern is that the translator does not reference the Hackett edition of Kongzi's Analects. I understand that the translator can do his own translations, but there are some irksome little discrepancies between how he references Kongzi and how Slingerhand translates the same passages in the Hackett Analects edition. The third concern is that the translator believes he can deftly differentiate the true, original meaning of the text from deviances found in the Neo-Confucian tradition. This poses us with several additional concerns, two worth mentioning: a) those with an understanding of Gadamerian hermeneutics would, perhaps, be a little more demure and less likely to assert such a claim; and b) the translator assumes he starts with a pure, uncontaminated, original (sacred?) text. In all, these concerns can lead the reader to a false sense of confidence that for some, no doubt, will prove to be somewhat "Orientalist." The fourth concern is barely worth mentioning, but I will note it anyway. As the translator states in his introduction, his translation is an improvement over previous translations for several reasons, one being the addition of commentaries (including his own commentary), his resort to vernacular English, and his standardization of references to titles, units of measure, and so on (although I think he should have kept "li," and anyway, instead of using feet and inches, why not metric?). More importantly, he also notes that there are a number of passages where he has identified a mistake in previous translations, and provides an example involving king Xuan and a cow being led to slaughter. However, it would have been nice to see notations throughout the text when such moments occur, along with a brief rationale, all in all, like he does with the king Xuan example. Having those notational additions would have really embellished the scholarly value of this edition. But I will reiterate: You're not going to find a better, more accessible English translation, and even if you can read Chinese fluently in a manner that made sense to Mengzi, you probably wouldn't get as much out of the original text as you're provided here. All translations have deficiencies. Knowing those deficiencies only improves the value of the translation. I purchased this book for a Chinese philosophy class I was taking at Berkeley. This is a wonderful read all by itself, and content is well worth the price paid for the item. I would recommend this to anyone who is interested in learning more about Confucianism and Mengzi in general.